How do you get your entire family riding together? The Toronto Island Bicycle Rental’s recent sell-off of their old bikes has prompted many people I know to think about getting a tandem. Kathleen wants a bike to ride with her husband. Faisal wants to help his 8-year old keep up with his 14-year old. Sobia wants a better commuting option for taking her 8-year old and 3-year old to school. 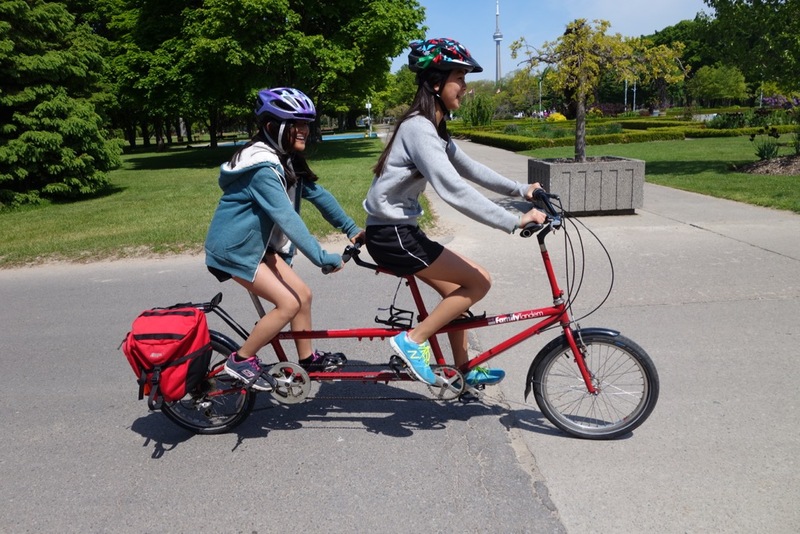 This article will give you some tips on buying a tandem in Toronto, with a particular focus on riding with children who have become too large for a trail-a-bike, but are not yet old enough to keep up or to navigate traffic on their own. A great place to start is Canada’s largest tandem dealer: the Meadowvale Bicycle Service in Mississauga. They have been in business since 1991, and have 14 tandems in their showroom. (Their showroom is the garage of David & Brenda’s house, and is open evenings and Saturdays.) They are the official dealer for Co-Motion, KHS, BBC, and da Vinci (that’s da Vinci tandems of Colorado, which is not related to Cycles Devinci of Quebec). They also rent tandems, so you can try one out before purchasing. Of the brands Meadowvale carries, David recommends Co-Motion and KHS for riding with your 8-year old. Both manufacturers have models that are specifically designed so that the rear position can be adjusted down for a child (or up for an adult). KHS models are priced around $1,500, whereas Co-Motion models are around $5,000. Part of the difference in price is due to KHS’s economies of scale: they are a larger company that makes fewer models of tandem frames (three) in a Taiwanese factory. 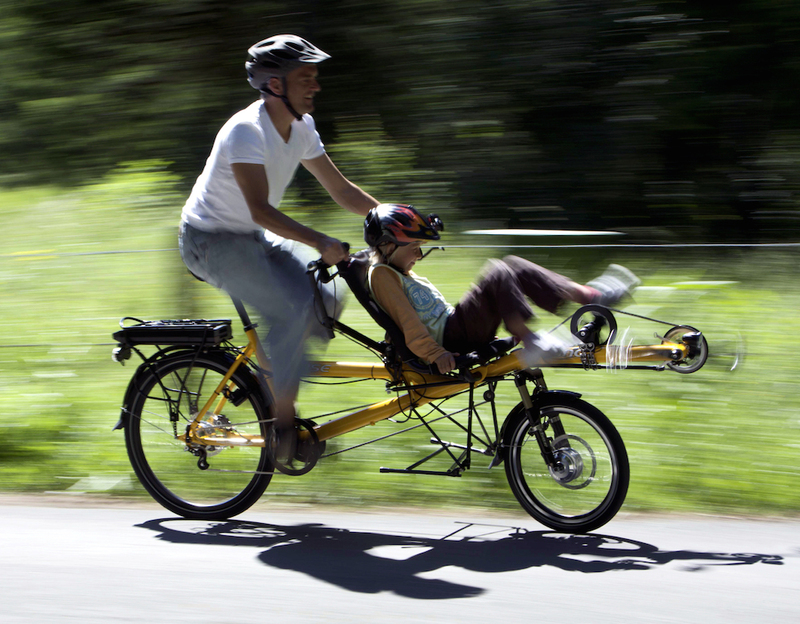 Co-Motion makes fifteen different models of tandem frames by hand in Oregon. They won the award for best tandem at the 2016 North American Hand-Made Bicycle Show. 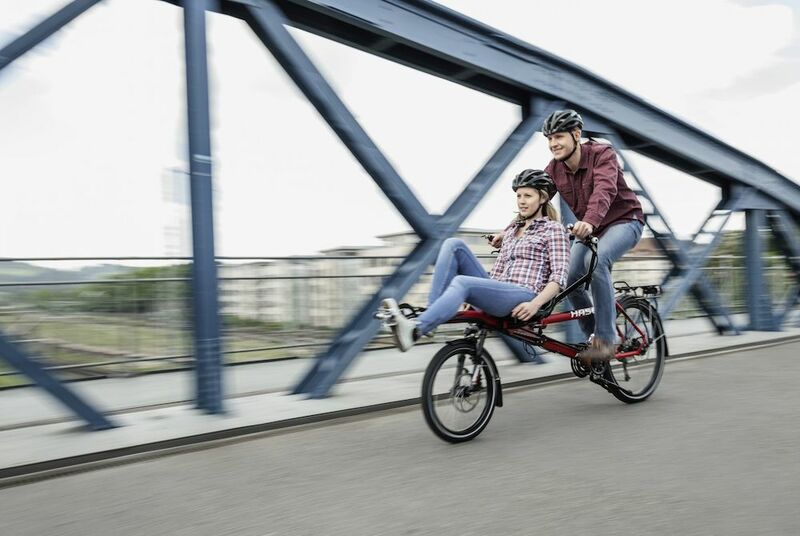 With Co-Motion you can get a bike that is fit very specifically for your family (in addition to higher quality components and more choices of paint colours). 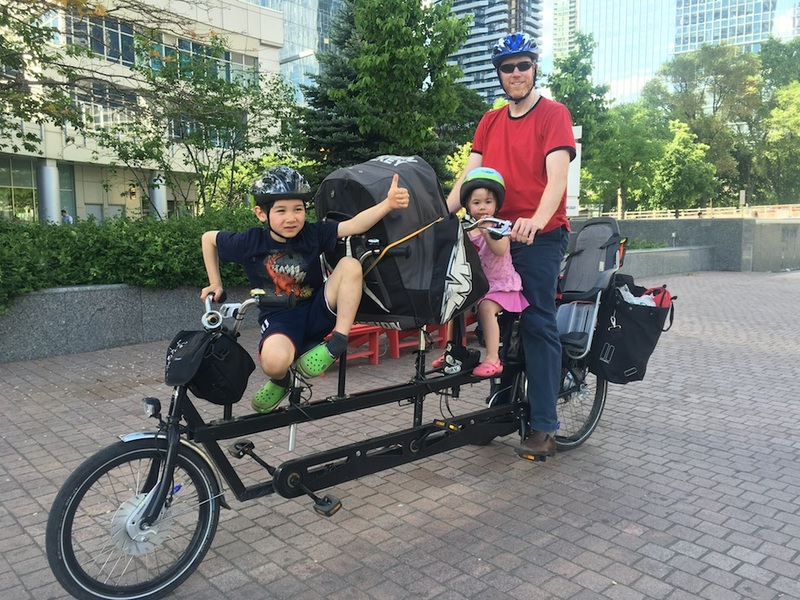 @WhitlaMike and @PedalPapa both ride Co-Motion tandems with their children around town in Toronto, and @WhitlaMike’s family has also done long-distance touring with theirs. The bikes discussed so far have what I would consider to be a conventional tandem frame design: captain in the front, stokers in the rear, everyone on a regular bicycle saddle, with a large frame that is hard to travel with. There are at least three tandem designs that break this mold in different ways: Onderwater XL, Hase Pino, and Bike Friday. The Onderwater XL and the Hase Pino put the captain in the rear. The captain is the person who steers the bike, so these bikes have a mechanical linkage from the captain’s handlebars to the front wheel. Being in front gives the stoker a better view, and makes it easier to have conversations while you’re riding. These two tandems also allow the stoker to take a break from pedalling, which is a nice feature for children and is not commonly found on other tandems. Finally, these bikes are both good for carrying cargo when you do not have a stoker --- although the Hase Pino is better for this, with a cargo capacity of over 200 litres (twice the size of the largest hiking backpack). I have used my Onderwater XL to carry a step-ladder, a fifty pound roll of flooring underpadding, some lumber, a stationary exercise bike --- and more ordinary things, like hockey equipment or groceries (both of which I do every week). For all these similarities in features and capabilities, the Onderwater XL and Hase Pino could not be more different. The Hase Pino has the stoker in a recumbent seat and the captain in a regular saddle, whereas the Onderwater has everyone in a regular saddle. The Hase Pino splits into two halves for easy transportation in a compact car. The Onderwater XL is just about the largest and heaviest thing on two wheels: it barely fits into a cargo van, and requires both strength and technique to engage the kickstand. The Hase Pino is constructed with care in Germany, and is available at Urbane Cyclist on College Street in Toronto, as well as at Hamilton Trike and Bent. The Onderwater XL is hand-made in The Netherlands, and is available from Urkai in Burlington (who will deliver it to Toronto in their cargo van, and is where I got mine from). Brown Cycles in Colorado makes the Kidz Tandem, which is similar in design to the Onderwater: the kids ride in front. It is not available at any shops in Toronto, but I met a lady riding one in the bike lanes: she imported it herself, and has been commuting her son to school and herself to work with it for several years. My impression is that it is lighter and sportier than the Onderwater, whereas the Onderwater can carry more cargo and weight. Bike Friday makes tandems that can be packed into two suitcases for air travel, so you can go on bike tours around the world. They made their first Family Tandem back in 1995, and still make all of their bikes by hand in Oregon. Before Bike Friday, they invented the Burley child trailer (almost forty years ago). Their daughter, Hanna, was the first child in the trailer, and is now President of Bike Friday. Jun Nogami has been riding a Bike Friday Family Tandem with his daughters in Toronto for several years. Bike Friday can be ordered directly from their website, or is now also available in Toronto from a new vendor, CityAndCargo.bike (disclosure: I am friends with the proprietor, Stuart Kinner). 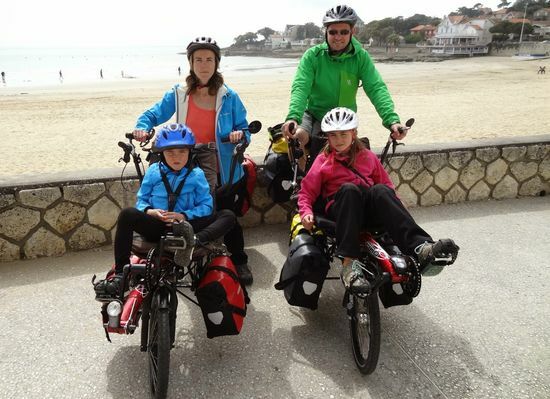 What if you want to bring two children on your tandem? The Onderwater XL, Kidz Tandem, and the Co-Motion Periscope Trident both have two stoker positions. (Onderwater and Kidz Tandem also have versions for just one child.) The Trident is better for long rides in the country, whereas the Onderwater XL is better for carrying groceries along with your children on short rides around town. Bike Friday has in the past made a triple-tandem, and might do so again as a special order. With a triple-tandem you might also be able to get two adults and a child on the bike, depending on everyone’s size: this is what we do on our Onderwater XL. If the second child is young enough to ride in a child seat on the rear rack of the bike, then the best choices are the designs where the captain is in the rear: the Hase Pino and the Onderwater XL (and maybe Kidz Tandem). This will make it easier for you to get the young child into and out of their seat, and also make it easier for you to control the bike. An added bonus of this configuration is that your children cannot fight with each other when you are seated in between them. Alternatively, you can hitch a child trailer to any tandem. There are a few other bike stores in town that can special order a tandem, but they don’t keep them in stock, and don’t know if the one they can special order would be suitable for a child stoker. The two Canadian Tire locations that I frequent both have a Schwinn tandem in stock (for $800), so you could easily try it out to see if it fits your family. If you are travelling stateside, Tandems East in New Jersey carries Co-Motion, Bike Friday, KHS, and Kidz Tandem. They also carry Bilenky, which makes a bike like the Hase Pino. The value that you get from a bike depends on how much you use it. My family rides our Onderwater XL every weekend, all year round. It is our main mode of transportation in the city: to the hockey rink, to the grocery store, to the movies, and to the park. These days we only drive when we are going out of town. 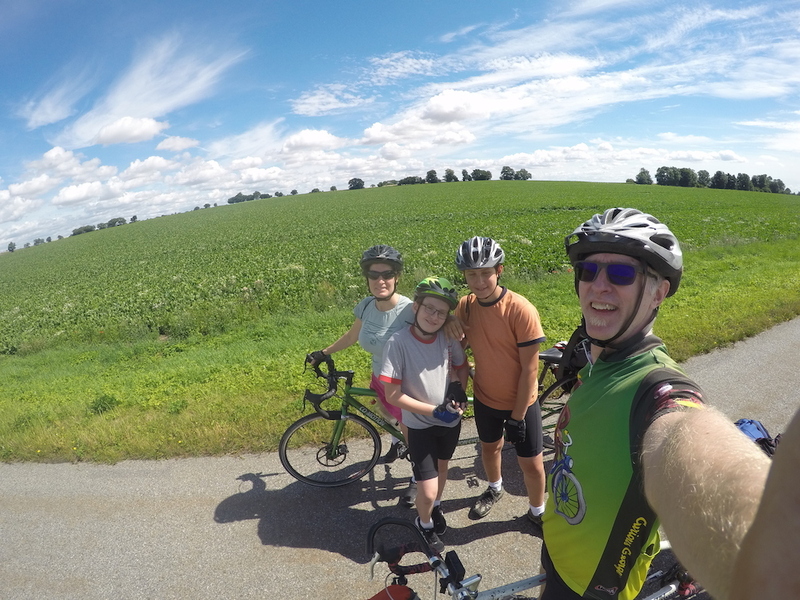 While our triple tandem might be expensive compared to some other single bikes, it is much less expensive than a car. Mr Money Moustache, a Canadian who lives in Colorado and blogs about frugal living, believes in the home economics of bicycles: even if you also use a car for many tasks, every mile you ride your bike instead of driving a car saves you money. A bike that fits your family and your needs is a healthy and joyous way to pinch your pennies. See you in the bike lanes! The Buddy Bike is another rear-captain tandem for use with a child. Available at Hamilton Trike and Bent. Great collection of tandems! Another vote for the Buddy Bike to be added to your list. Created for adaptive cycling, but wonderful for all families. 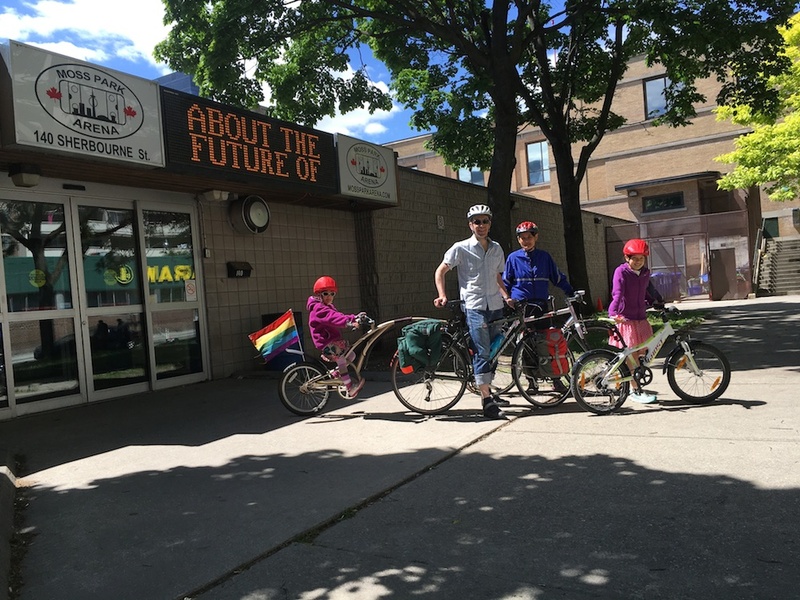 This isn’t Toronto-specific, but it would also be cool to include information about Kidbacks (more adorable pictures here) and crank shorteners and pedal blocks for making regular tandems work for riding with kids. The Circe Helios is amazingly adjustable. And finally a link for the Bilenky Viewpoint you mention in the post. Semi-recument tandems are so versatile and popular with family bikers for all ages! Surprised to read that Dorie Apollonio (@HumOfTheCity) rides her 7 and 11 year old around in her Bullitt front-box cargo bike: as she says, she would not have imagined that this would work with children of this age. R+E Cycles of Seattle makes expandable tandems: a parent at each end; insert kids in the middle as needed. Cool! Only available directly from them. In business since 1973.